One of the most common sources of static electricity in automated processes is friction. As two (or more) materials move against each other, static is produced due to the triboelectric effect. By definition, the triboelectric effect is a type of contact electrification in which certain materials become electrically charged after they come into frictional contact with a different material. If these materials are non-conductive, or if they are not grounded, the static charge will remain. This was the case for the machine shown above. 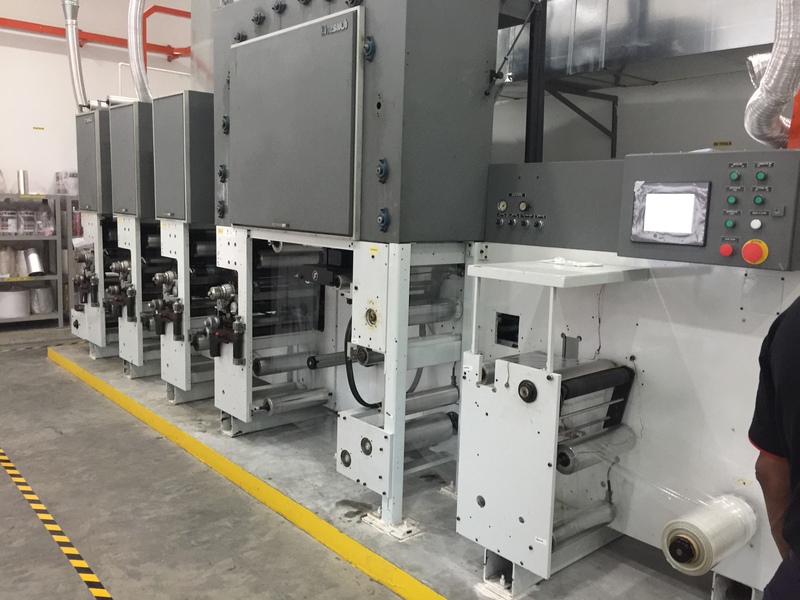 This machine is a Chesnut 150 Gravure Print Station. 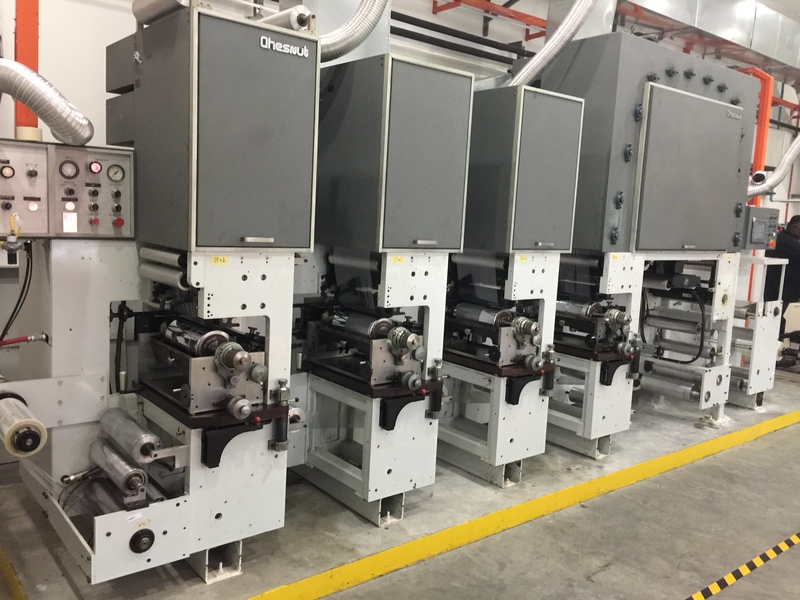 It is used for printing, coating, laminating, and sometimes die cutting of paper, light paperboard, films, polyester, flexible packaging and aluminum foil. In this application, a roll of plastic is dispensed, but a static charge is preventing proper printing on the plastic as it travels from roll to roll. As the film is separated from the roll, a static charge is produced, and this charge is carried through the process at values ranging from 3,000 – 20,000 volts. The manager for this production area contacted EXAIR to see if there’s a viable EXAIR solution to remove this static charge. They were interested in a solution that could eliminate static on the full width of the plastic, could be mounted 200-300mm away from the rollers, and could be replicated at multiple places along the machine. With this in mind, the best solution was to use a series of 18” Super Ion Air Knives installed periodically along the path of plastic within the machine. Operating at a low pressure of 1-2 BARG (14.5 – 29 PSIG), the Super Ion Air Knives create an evenly dispersed, quiet airflow of static eliminating ions with a low compressed air consumption. Using the laminar, static eliminating airflow from the Super Ion Air Knife, this solution can be mounted away from the static charge, allowing the ions to “rain” down on the affected areas. For this application finding a solution meant finding a method to keep production on schedule. Without static elimination this machine faced defects, downtime, and decreased efficiency. Using EXAIR Super Ion Air Knives brought this application back up to optimal operating speeds, keeping the revenue generating process of this manufacturer ongoing. Colder weather is here and static comes along with it. If you’re experiencing a static related problem in your facility, contact one of our Application Engineers. We’d love to help you find a solution.